We’re proud to be the Gold Coast’s flagship film event, promoting the city as a major Australian filmmaking destination and supporting the development of the local screen industry. Our industry program is a highlight of the festival and draws screen practitioners from across Australia to the sunny Gold Coast. As Australia’s top holiday destination, the Gold Coast Film Festival is unique in combining work and play. Smash out your business and networking needs during the day with industry panels, workshops and events just 10 minutes from the beach, then at night enjoy the special events on offer in one of our incredible outdoor locations. From outdoor screenings in the lush green hinterland to sunny Surfers Paradise beach, popup cinemas in urban laneways and a floating cinema on the Broadwater, Gold Coast Film Festival truly is a destination film festival like no other. We invite the screen industry from across Australia to join us at the Gold Coast Film Festival! Immerse yourself in one of our 25+ industry panels, screen industry guild nights, networking events, gala dinners and filmmaker Q&As. We’ve made your trip as easy as possible with suggested 3 – 5 day trip itineraries, a free festival shuttle and an exclusive discount code to stay at our partner hotel QT Gold Coast. The industry program is split across two weekends, highlighting traditional filmmaking topics over the first weekend of the festival and new storytelling and screen content across the second weekend. Stay for a night or stay for a week and explore Queensland’s biggest film festival – and best (or so we’ve been told). Get planning early and book your trip to the Gold Coast Film Festival, 3-14 April 2019. Full program on sale now. Want to experience multiple days of the festival or sneak away for a weekend trip to the Gold Coast? We’ve put together 3-5 itineraries so you can make the most of your visit. Thinking of a mid-week trip? The ‘Weekday Work Trip’ is perfect for your typical weekday business trip (or at least that’s what you can tell your boss). Wednesday sees the unbeatable red carpet opening night of the Gold Coast Film Festival with the Australian premiere of 2040 + Q&A. Thursday is the prestigious Screen Industry Gala Awards featuring an In Conversation with icon of screen, television and stage, Sigrid Thornton. Don’t miss the highly-anticipated Women In Film Lunch on Friday where we recognise women in the film and television industry at an intimate networking lunch, followed by a WIFT guild event with panel and networking drinks. We suggest arriving into the Gold Coast around lunch time to check in to your hotel and freshen up before Opening Night in the evening. On Friday, depart the Gold Coast as late as possible in the evening to make the most of Women In Film Lunch and the WIFT Australia guild event in the early evening. What better way to make the most of a mini vacation than spending a long weekend on the Gold Coast, mixing work and play with industry opportunities and unique outdoor screenings? Arrive early Friday for the Women In Film Lunch at QT Gold Coast, a three-hour buffet lunch and networking event celebrating women in the film and television industry, followed by a WIFT guild event and panel on diversity. On Saturday, make the most of panels covering distribution, cultural awareness, working in Hollywood, accounting and legals. Round out the day with a Q&A screening of Elements followed by SIPFest Short Film Festival on the sands of the iconic Surfer Paradise Beach. On Sunday, take in panels covering shorts, pitching and makeup/SFX, a Q&A screening of Emu Runner, or jump on board the Gold Coast Movie Locations Tour – a 3.5 hour guided tour of the Gold Coast screen industry. Let your hair down with some fun and unique outdoor events to turn your work into play!  We suggest arriving into the Gold Coast early on Friday morning, checking into your hotel and kicking off your trip with the highly anticipated Women In Film Lunch at QT Gold Coast followed by an afternoon of panels, guild events and premiere screenings.  Check out panels on during the day on Sunday, then head to Surfers Paradise beach on Saturday night for SIPFest. Then on Sunday, depart the Gold Coast in the evening to make the most of a full day of panels and workshops and jump on the Gold Coast Movie Locations Tour. Go all out with the ‘See and Meet Everyone’ trip and well… see and meet everyone!  This 5 day trip covers Opening Night: 2040, Women In Film Lunch, Screen Industry Gala Awards, SIPFest, guild events, industry panels, filmmaker Q&As and heaps more! You’ll leave the Gold Coast Film Festival with new contacts and hey, probably some new friends too (we’re a friendly bunch). We suggest arriving early afternoon on Wednesday so you can check into your hotel and freshen up before Opening Night in the evening. On Sunday, depart the Gold Coast as late as possible in the evening to make the most of a full day of panels and workshops and jump on a Gold Coast Movie Locations Tour. Are you an emerging filmmaker or looking to broaden your skills in new screen content and storytelling? The second weekend of the festival is all about NEW! Friday is our ‘Emerging Filmmakers Day’, full of panels and workshops tailored to emerging screen practitioners, and ending with a screening of EMERGE! QLD Short film showcase and gala film screening. Saturday is jam-packed with industry panels, filmmaker Q&As, Web Series ‘In Competition’ screening, virtual reality and networking events. Sunday brings more industry panels, a live script read, guild event, and we round out the festival with the world premiere of locally shot film Escape and Evasion + Q&A for Closing Night. Friday – Burleigh Brewing Outdoor Cinema with the 90’s classic Boogie Nights and of course, Burleigh Brewing beer! Saturday – Horror In The Hinterland, a brand new outdoor cinema experience in the lush hinterland of the Gold Coast. Chills and thrills included!  We suggest making your way to the Gold Coast early on Friday morning to get settled in for a full day of panels, workshops and events. On Sunday, book a late departure or stay the night to make the most of the final day and help us wrap up the festival at Closing Night. 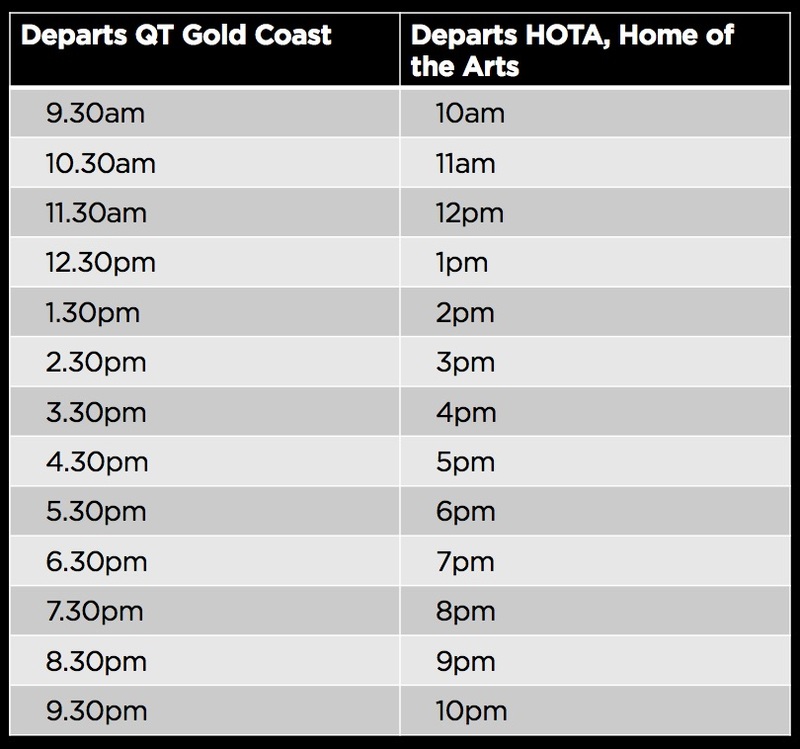 A free shuttle bus will be operating between QT Gold Coast and HOTA, Home of the Arts from 9.30am-10pm on Friday to Sunday each weekends during the festival. Buses will depart QT Gold Coast at half past the hour from 9.30am and from HOTA on the hour every hour from 10am. QT Gold Coast is the official hotel partner of the Gold Coast Film Festival. Exclusive to GCFF guests, use the promo code GCFF19 to receive 20% off the best room rate available. Celebrating eclectic design and bold entertainment, QT Gold Coast offers guests an intriguing yet relaxing beachside experience. Standing tall just back from the golden sands of Australia’s most spectacular coastline, this contemporary resort sets a new standard in designer accommodation in Surfers Paradise. Blending nostalgic surfer chic and Miami catwalk cool, QT Gold Coast is deliberately intended to satisfy appetites, inspire conversation and arrest the senses. We have all the tips and tricks on how to get here, where to stay and what to do on the Gold Coast!